For the Memorial Day holiday weekend, Zagg.com had a super sell. Just about everything in their store was 50% off or more. I am a big fan of Zagg’s InvisibleSHIELD screen protectors and ZaggWipes so I thought I would take advantage of their sale. For whatever reason I didn’t order any InvisibleSHIELDs for my new iPhone or new iPad. Instead I purchased the Zagg Sparq 2.0 battery for Ryan’s Android phone. Its battery life is abysmal. I also picked up a pair of Zagg SmartBuds. 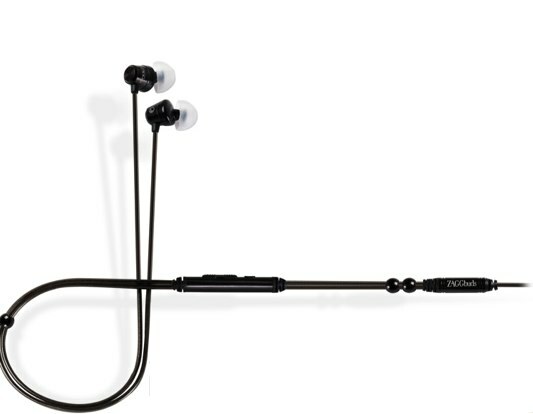 I’m in the market for some good workout headphones that don’t cost the $350 my Klipsch Image X10i headphones cost and thought these would be a great alternative. The normal retail price for the headphones is around $50 but the sale brought them down to $25. Typically I only review products that I have purchased for myself and typically those products have been heavily researched before I make that purchase. Thus, most of my reviews are positive, glowing even. This is not one of those reviews. If you learn one thing from this review it will be that the Zagg SmartBuds are perhaps the worst headphones I have ever purchased. Want to know why? There is so much wrong with these headphones that for brevity I’m simply making a numbered list. The cable is wrapped in InvisibleSHIELD (so it doesn’t get scratched?) make it grippy, catching on slick surfaces and to itself. The design requires you to wrap the headphones around the back of your head which makes for a confusing initial setup. That grippy InvisibleSHIELD makes moving the metal beads used to adjust the fit difficult. The cables make noise as you move. If they bump into something it sounds like the sound you hear when bridge cables shake in the wind (which is weird). The volume control is separate from the remote control leaving two heavy metal tubes on your headphone cable, requiring you to bounce between the two to adjust volume as you skip through tracks. The volume control is a slider and does not change the volume within your iDevice. Instead it works like those really cheap headphones you got with your old Sony Discman in 1995. The volume control cuts out left/right channels as you adjust so it’s pretty pointless. Either turn it all the way up or all the way down, otherwise one side is louder than the other. The volume control is scratchy as you slide it up and down, not a pleasant sound. The provided ear tips didn’t fit me very well, a first. None went in and stayed secure for more than a few minutes. This is likely due to the fact that they are more plastic than rubber or silicon. Even the “memory foam” ones have this glossy finish that makes them slide right out of your ears. The sound isolation provided by these subpar ear tips is almost non-existent. The sound quality of the headphones is pretty horrible. Everything sounds like it’s underwater or as if the band is playing in a tunnel. The bass response is muddy and mucky. There is no speed in these headphones. If you listen to a heavy percussion set, it sounds as though the drummer was drunk during the recording. The midrange is shallow, no depth or passion in vocals, not even from Adele, Brendan James, Christina Aguilera, Jennifer Hudson, Rufus Wainwright or Sasha Sacket. The highs are about as bright as a 5 watt night light. The microphone is marketed as “noise canceling” which I can say without a doubt isn’t accurate. The Play/Pause button only sometimes works. Sometimes it makes the volume jump up or down instead of its intended action. The list could go on but these headphones aren’t worth the effort. At $50 it’s highway robbery, at $25 is an honest mistake. Let’s see how they stack up spec wise versus a few tested and true headphones. Even though the Klipsch Image S3 doesn’t have a microphone, volume control or track control capabilities, it is still a much better buy than the Zagg. What would you rather have? A solid headphone that puts out great audio, has a history of reliability from a company who’s been making audio products for decades or a similarly priced headphone that has all these features but they hardly work and even when they do, it’s a lackluster experience? It’s why infinitely more people purchased the 2000 Lexus GS300 as opposed to the 2000 2000 Daewoo Leganza. If it sounds too good to be true, it probably is. The Zagg Smartbud headphones might as well be a 2000 Daewoo Leganza. Promising specs but disappointing performance. If Zagg had given me these headphones, I’d send them back. My hearing was off after listening to music with them for around thirty minutes. It was an aural experience I have never experience before. UPDATE: For the commenter that says I am biased, how about this from Amazon? It doesn’t look good for Zagg Smartbuds on Amazon either. Either save up the money and get something like the Klipsch Image S4i or skip the remote control and microphone and get something like the Klipsch Image S3. There are a ton of other headphones out there that are superior to the Zagg at or around the same price. Do some research and as always, if you have any questions, leave them in the comments below and I’ll be happy to answer. This product is so horrible, and it looks like the Zagg Sparq 2.0 might fair as poorly, that I am questioning any future purchases with Zagg with the exception of their InvisibleSHIELD product. UPDATE: After over a month with the Zagg Sparq 2.0, I am pleased. It has performed as you would expect a high quality product should. This entry was posted in Headphones, Nerdiness, Rant, Review, Thoughts and tagged Brendan James, Christina Aguilera, Etymotic Research, Headphone, headphone review, InvisibleSHIELD, iPad, iPhone, iPhone headphones, Jennifer Hudson, Klipsch, Klipsch Image S3, Klipsch Image S4i, Memorial Day, product review, Rant, Rufus Wainwright, Smartbuds, UltimateEars, Zagg, Zagg review, Zagg Smartbuds by Justin Scott. Bookmark the permalink. This has to be the most bias piece of sh!t I have come across, you call yourself a reviewer? What a joke. @SimsCreed You are more than welcome to have this feeling. I gave my honest opinions of these headphones after having owned and tested dozens of other headphone options out there. I found this to be the worst headphone I have tried. Worth noting is that I don’t review products I don’t think are going to be great. So there are obviously worse headphones out there, but they are hopefully not the headphones I would waste my time reviewing. I would suggest you look at the reviews on Amazon.com where this product gets a 2.5 star average review. I am not alone in my issues with these headphones, from build quality, to fit and performance. Many people complained theirs broke within weeks of owning them. Over at the top headphone bulletin board, here is what one of their top posters had to say about these headphones. The person who started the thread asking about these headphones said he had to return them, requesting a “return merchandise authorization” which just goes to show, I am not alone in my thoughts on these headphones.